27th April – Saturday - Moseley Arts Market. Moseley, Birmingham. New Event for the craft in focus organiser, come view and purchase contemporary craft and art. The popular Festival Market is back on the first Saturday of our summer Festival with around 140 stalls including arts and crafts, food produce, refreshments and family activities. There will as usual be free live entertainment from local performers throughout the whole day in front of the Cathedral so after you’ve browsed the stalls, grab some food and find your spot on the grass to enjoy the entertainment. This is such a great trip out for all the family so don’t miss it! Jephson Gardens, Royal Leamington Spa. Craft In Focus returns to the RHS showcase garden in Essex. 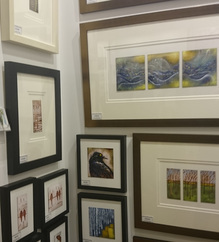 Over 3-days the art& show has over 120 artists work for sale & commission from a wide price range of £10-£10,000+.